Hoyas advanced into AABA Finals. 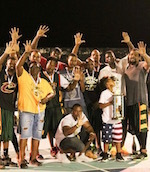 They outscored Raiders 67:59 in the decisive third game of the semifinal series to reach the title series. Daury Herbert scored 14 points to pace the charge. Hoyas accumulated a 23:19 lead at the first break. They maintained the lead throughout the second stanza. Hoyas clinched a 32:25 halftime lead. The gap grew deeper in the third term. Hoyas entered the fourth period up by as many as 16 points 54:38. Raiders narrowed the deficit in the final stanza but surrendered at the end. Ian Connor (203-F, college: Mansfield, PA) tallied 13 points and 14 boards for Hoyas. Carlo Gumbs posted 12 points for the winners. Crefton Gumbs answered with 26 points and 11 boards for Raiders. Elisban Valera netted 12 points in the defeat.